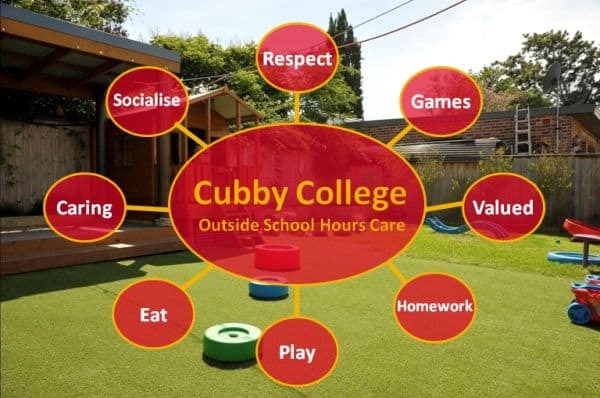 Cubby College provides care for primary school age children before and/or after school hours during school terms and strictly for children attending Strathfield North Public School. Our Centres main focus is to provide stimulating developmental, social and recreational activities for children, while meeting the care requirements of families. The Children will be provided with breakfast and quiet activities and then escorted to school. The children will be collected from school and escorted to the centre on foot. Afternoon tea is provided, along with a variety of art and craft activities, active and passive games and experiences that will enhance the child's social, emotional, creative and physical development. Complete the enrolment form – Please contact the Centre Director requesting the OSHC enrolment form this can be sent via email or a hard copy can be picked up from the service. The details required on the enrolment form are needed by our staff to help them take the best possible care of your child. All information is strictly confidential. If any of the details on the enrolment form change you are asked to advise the Director immediately. Note: due to the unpredictable nature of waiting lists, the centre can make no guarantees that a placement will be available when you require care, nor can we provide estimated times when positions will be offered. Parents can request to book a tour online. Throughout the enrolment process, parents will be provided with a parent handbook for more information on the service.